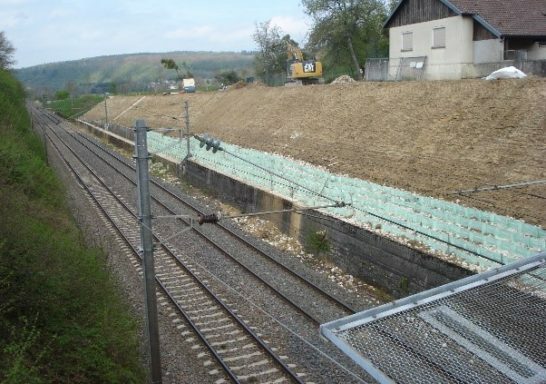 The project concerns the resumption of a slope slide overlooking a railway axis in the municipality of LA PRETIERE (25). A leading roadway was also taken over. 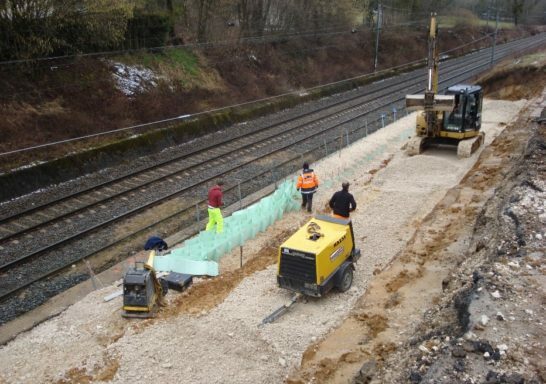 A ground mass reinforced with M3S® cellular geotextiles was made as a foot stop for all the structures. The structure is backfilled with a 0/31.5 gravel input. The latter rests on an old masonry wall along the railway track. The top slope was reshaped to a 3H/2V slope and vegetated. The portability of the reinforcements (less than 10 kg per cellular sheet) and its rapid deployment (massive and facing) allowed for rapid intervention and execution in the field, which did not alter traffic. On the front panel, a protective geosynthetic was deployed by stapling and pinning within the M3S® massif.